Boonsung is a ‘wreck’ but it is not a shipwreck. Also, instead of an accidental sinking, like most wrecks, it was probably deliberately sunken. The structure is an old tin dredger that was used for many years. When it became redundant the easiest and cheapest solution to dispose of it was to pull it out to sea and sink it. Some claim that it sank by accident, and the year it is claimed to have sunk was in the late 1970s to mid-1980s. Also, rumour is that the Thai navy deliberately damaged the top of it due to concerns that it was too near the surface. And the 2004 tsunami broke it up more, meaning that it no longer resembles its original shape or state, and there is no option for divers to get inside. It’s located about five kilometres from the mainland, and 20 kilometres from Tab Lamu Pier, in Khao Lak. 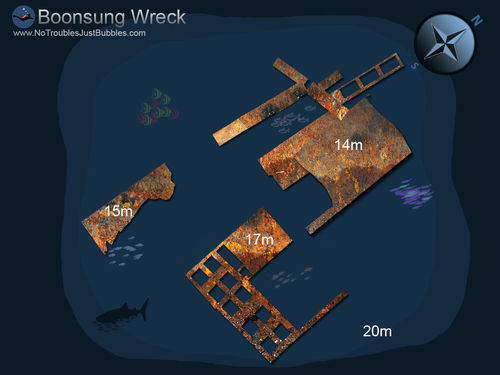 It is large enough for 30 or more divers to visit without bumping into each other, and what is left of the structure is holding up quite well. What Are The Diving Conditions At Boonsung? Boonsung is on a flat sandy sea bed at a depth of around 20 metres. Because of it being surrounded by just sand and not too far from the mainland, the visibility is limited. On a good day, it can be as much as 15 metres, but less than 10 metres is most common. The structure is not more than 5 metres in height, which means than the whole dive is spent around 20 metres, depending on the tide. This means that Open Water divers whose certification limits them to 18 metres may not enjoy diving at Boonsung Wreck. And even for divers who are certified to 20 or more metres, the bottom time can be an issue, because the dive profile is quite deep for the whole dive, then straight up to a 5 metre safety stop. This is particularly difficult for those divers who are at the end of a liveaboard diving cruise and already near the limits after repetitive dives, and many are planning to fly the following day. What Can Divers Expect to See At Boonsung? 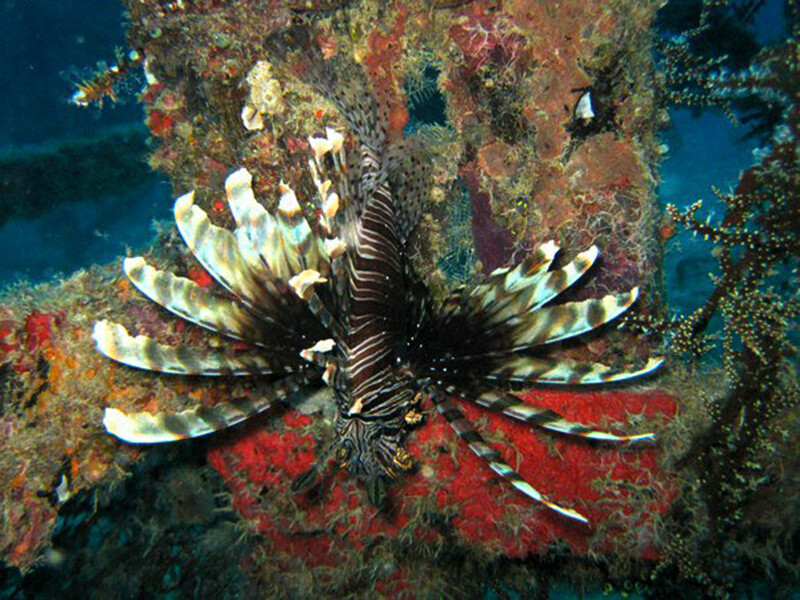 Lionfish at Boonsung WreckEven if the visibility and topography at Boonsung are nowhere near as good as at other Similan diving sites, the marine life here is always well worth the visit. It’s a haven and a nursery for tens of thousands of individuals, and dozens of species. 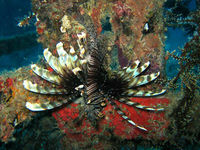 Most notable are the Porcupine Pufferfish, Scorpionfish & Lionfish, which can be seen all around the dive site. There are also many other species of bony fish, some of which are jouveniles beginning their life under Boonsung’s protection and others live here as adults. Why is Boonsung Visited By So Many Boats? Both daytrip boats and liveaboard diving boats come to Boonsung every day of the diving season. The main reason for coming here to dive when compared to other wrecks and The Similan Islands is the location. Boonsung is a short distance for the day trip boats to cover, and it’s the final stop off for most liveaboard boats on their way back from The Similan Islands & Richelieu Rock. For logistical reasons, it makes sense for the liveaboards to stop at Boonsung for one or two dives in the morning of the final day of the trip, then guests can disembark just an hour or two after they finish diving. This is a good scuba diving site located not too far from Khao Lak, which is in Phang Nga province in southern Thailand. Inexperienced Open Water divers may feel that it’s not ideal because its shallowest point is around their 18-metre certification limit. Divers who are able to enjoy its depth are guaranteed to see thousands of fish, even if the visibility isn’t as good as in other areas nearby. There aren’t any rooms or a hull for divers to explore, which means it’s just structure on the seabed to dive around. It is not at all a bad dive site, but most divers who visit Boonsung on a liveaboard diving boat have just come from places such as Richelieu Rock, Koh Tachai & Koh Bon. These other dive sites are much better than Boonsung, with clearer water, more colour, and something to see at various depths.